Portumna Castle has been studied by art historians and architects alike due its innovative design that was influenced by trends originating from Britain and the Continent. However, when it came to the conservation and restoration of the castle and its grounds in the early 1970s there were questions that remained unanswered. Small-scale archaeological excavations at Portumna were carried out over a period spanning almost three decades associated with the restoration programme of the castle. The results of the excavations have revealed fascinating insights into various aspects of the castle’s architecture, drainage, surrounding gardens, and early driveways. battlements and small curved gables with pedestals and balls adorned the roof line of the castle. 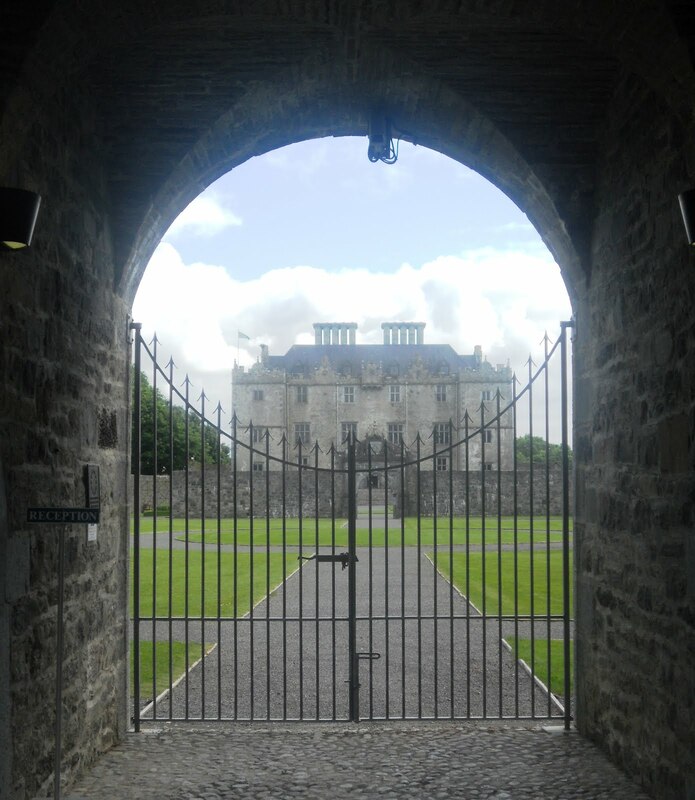 The design of Portumna represented a transitional structure between fortified castle and the typical larger house of the eighteenth century, retaining elements of defence such as firing holes and bawn walls, but essentially forming a domestic residence. These types of transitional structure developed in Ireland between the end of the 16th century and the beginning of the seventeenth century (Leask 1999). the devastating fire of 1826, and detail the layout of the original rooms in the basement, ground floor and second floor. An estate map by Cuddehy which dated to 1791 has also been instrumental in reconstructing those parts of the castle and grounds with no extant aboveground remains. Guests to the castle, the Beauforts, wrote extensively about Portumna Castle in their travel diary, dated between 1807 and 1810, and this diary provides further information of particular interest, especially concerning the castle interior (Craig 1976). 7.evidence for the line of the driveway. The various excavations revealed a tantalising glimpse into the earliest stages of the construction of Portumna Castle and its associated buildings and gardens. The initial marl layer upon which the castle was built was even identified, along with an early seventeenth-century layer of mortar which was found in the castle’s interior. 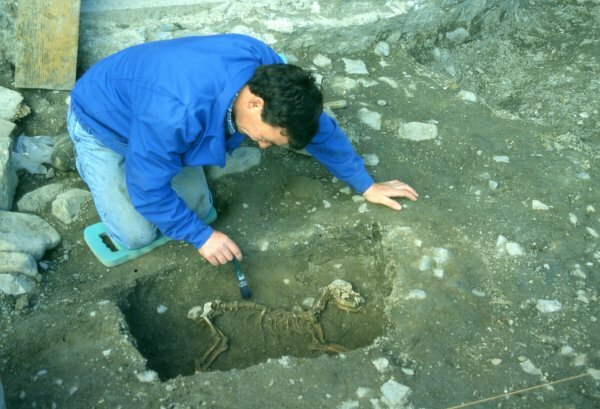 This layer contained traces of timber and iron slag as well as evidence for scorching which suggested that perhaps smelting had taken place here and that it was possibly even associated with the construction of the original buildings. Several successive layers were also excavated that comprised the original stone and mortar foundation of the castle (in the immediate area to the west of the castle) and which contained dumps of stone, mouldings and mortar and red brick fragments. Some of this material derived from the construction of the basement. These layers were associated with the construction of the castle and the continued renovations and reconstructions resulted in a fluctuating ground level. It was therefore apparent that the original ground level would have been substantially lower. Initially, the castle was constructed with some discernable defensive attributes. Foundations for a possible tower which pre-dated the original castle drains were identified in the area to the west of the castle and represent one such defensive measure. A second important original defensive component of the castle was the bawn wall. The bawn wall was, for the most part, destroyed in the late eighteenth century, presumably when renovations were made to the castle; however, some of the east – west and north – south sections were still standing after 1791.
elaborate drainage system. The original castle drains were an integral part of the castle’s planned layout. During the 1980s and 1990s the castle had been experiencing problems with an internal stone-lined drain – which was not functioning satisfactorily and which flooded every winter in the basement – and therefore, large-scale excavation in the interior of the castle was designed to explore and repair this drainage system. The system centred upon the original main stone-lined drain into which smaller ancillary drains ran. The main drain ran from the northeast – southwest corners of the castle and out under the bawn walls and into the field to the west where it discharged into an open ditch. The lintels of the drain formed the base of the bawn wall which demonstrated that it was an original feature of the castle’s layout. This drain was relatively undisturbed in the north end of the castle and in the central spine, but was disturbed in the southern castle basement due to previous clearance works. It was this disturbance that had caused the drain to cease functioning successfully and the ACS excavations facilitated its repair and restoration. The 1760 plans of the castle interior give details of the layout of the original rooms in the basement, ground floor and second floor. A substantial amount of disturbance had taken place in the castle interior, especially in the basement, since the fire of 1826. Despite the disturbance, the lines of the walls on the 1760 plan could still be seen in the plaster in the later walls of the castle, thus validating the accuracy of this early representation. The combination of the plans and the excavations facilitated a greater understanding of the layout of the castle interior during this period. well was located in the southeast end of the same room and would have provided a permanent water supply. medieval in date and associated either with the nearby abbey or with some other and as yet unidentified structure. The boundary of the medieval borough is known to have existed in this area of the Portumna demesne and it is also possible that the rock-cut channel represents part of this boundary. A north – south ditch was located mid-way across the south garden and had been backfilled prior to 1791. It was located at equidistance between the central front of the castle and the western garden wall and was most likely constructed in order to provide symmetry with the castle. Ephemeral evidence for other early features included the foundations for a building constructed against the bawn wall to the west of the castle, a further two rubble wall foundations also to the west of the castle, and also a portion of a building which was cut by a later ha-ha and which contained a fireplace and a flagstone floor, located to the southwest of the castle. Several cobbled paths were also present immediately along the southern front of the castle and some of these were disturbed by the construction of the porch and were therefore dated to the early to mid-eighteenth century. The porch construction in 1797 also disturbed several of the earlier drains in this area. wall consisted of limestone blocks cut and carved with a decorative punch -work finish. Pavia acknowledged that the dimensions, general style and stonework of these doors do not accord with the general Jacobean style of the castle but that the stonework does blend with the surviving gothic doorways in the abbey. She therefore concluded that the doors were originally part of the Abbey and that they were reused in the building of the castle. Dying about April 20 1797 aged 11 year was Interred near this Place. Alas poor Fury. She was a dog. Take her for All in All Eye shall not look upon her like again. castle, and post-dated an earlier garden in this area. The annex had several phases of renovations and much of it dated to the late nineteenth century but had been demolished during the 1970s and at the time of excavation was covered with a thick deposit of rubble, indicating that the area had obviously been backfilled. It was originally constructed prior to 1791, across one of the original external doorways. It comprised a substantial four-roomed building (12m long by 10m wide) of at least three storeys, including a basement. Subsequent renovations included the opening of a doorway in the wall of the castle which gave access from the main stairwell of the castle to the ground and first floors of the annex. Steps also led from the courtyard down into the lobby of the annex. The foundations for various internal walls were identified which demonstrated how the annex had been sub-divided into four rooms and a central hall. Two fireplaces, one on either side of a shared wall, were exposed. A brick doorway with a limestone doorstep represented a later insertion. 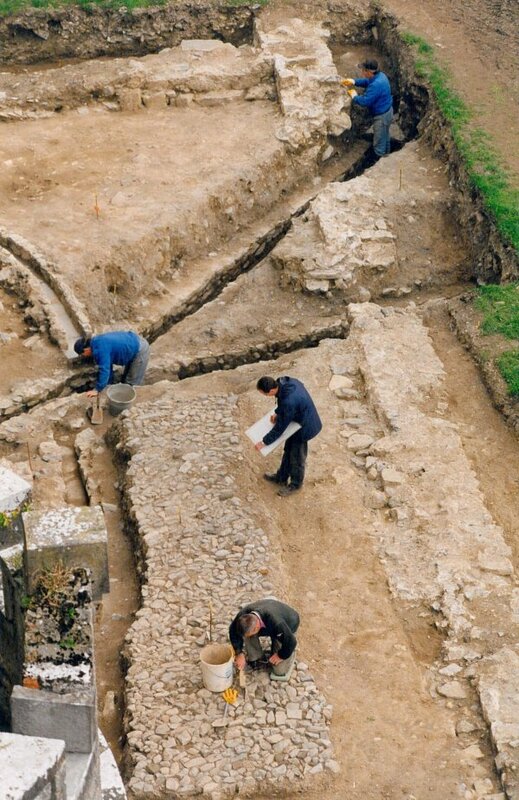 A cobbled yard was exposed in the northern section of the excavation area and ran almost to the walls of the annex. It was associated with the annex and probably dated to the c. 1824 renovations. providing the best visual approach to the castle – and is used with much more regularity than it was in the early nineteenth century. archaeological features in this area. The excavations revealed several outcrops of limestone, the foundations for the bawn wall on the west and east sides of the garden and the above-mentioned pre-1791 ditch. The exposed segments of bawn wall ran beyond the castle and were associated with a possible external ditch. Further segments of bawn wall were identified in other areas during the various excavations and these were marked on the 1791 map. Another section of wall, which may represent an earlier or smaller enclosure, was present on the internal, garden side of the bawn wall. 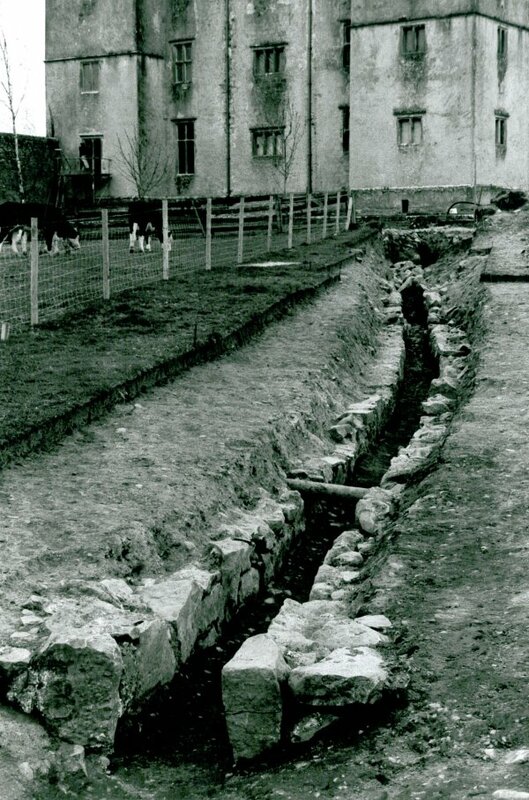 A stone-lined ditch was present to the east of the garden, near the perimeter of the medieval abbey, and would have been associated with one of the later drains exiting the southeast corner tower of the castle. It appeared to take water away from the icehouse, located in a wooded area to the southeast of the castle (beyond the excavation area). Part of the gravel roadway, which post-dated the rock-cut channel (see above), and which was present on the 1791 map was excavated. It appeared to lead from the town, along the old avenue, and into the churchyard, possibly towards the lake which lies in this direction. A geophysical survey was also conducted in this area and further test-trenches opened in order to investigate any anomalies detected by the survey. These trenches revealed the lines of north – south hedges or flower-beds located in this part of the back garden; these may have divided the garden longitudinally and suggest a formal layout of the south garden. Different phases of use of the garden were identified through various layers of made- up ground, including an east – west artificial bank and associated parallel ditch which effectively divide the garden into two further areas. In March 2005 the outer front garden, to the north of the castle, was investigated. The OPW planned to re-landscape this area and to model it on the Cuddehy estate map. It was therefore essential to recover any evidence for the previous garden layout and to assess whether or not it concurred with that represented on the map. A single trench was excavated and this confirmed the presence of rough gravelled pathways in a plan that conforms to the layout illustrated on Cuddehy’s 1791 map. No evidence was recovered for any other paths or garden features. The paths consisted of coarse gravel and larger flat stones which may represent the remains of paving. They occurred at set intervals from both walls of the garden and therefore appeared to have been laid out very precisely. The evidence suggested the presence of a small path running around the inside perimeter of the garden at a distance of 1.8m from the boundary walls. In addition, a circular arrangement appears to have been present in the centre of the garden and consisted of a 3.2m-wide pathway positioned in a circular fashion with a smaller pathway constructed along its north – south diameter. No evidence was recovered for either an earlier or a later garden layout and it would appear that the arrangement shown on Cuddehy’s map continued until the castle was destroyed by fire. The geometric patterns and formality of this eighteenth-century garden are in keeping with contemporary picturesque theories about garden design. Indeed, the function of this garden is purely aesthetic. This northern garden would have played a crucial role in shaping the views and perceptions about Portumna upon arrival from the north. When this garden was created the northern approach comprised a tree-lined avenue. Visitors to the castle would have had their view and gaze directed by the trees towards the neat and formal gardens which lay in front of the grand architectural splendour of the actual castle. When the Gothick Gate and Outer Courtyard Gates were constructed along with the straight and properly laid driveway, this new heightened sense of formality would have been enhanced by the north garden. created in order to provide access to the vegetables. The correlation between some of the excavated paths and those marked on the 1791 map, combined with associated eighteenth- and nineteenth-century pottery, suggests that the kitchen garden was in existence from the late eighteenth century. The garden is also marked on the 1837 OS map which demonstrates that it was either still in use or that it was at least still laid out formally with the same paths by this date. Much of the kitchen garden area was disturbed due to later activity on the site, including two French drains. The kitchen garden would have been an important part of daily life at Portumna. Highly productive, it would have contained a diverse range of food, herbs and flowers for the family, staff and guests of the castle. Many of these plants would have been perennials and the garden would therefore have had an all-year-round visual appeal and utility. The pathways enabled the garden to be used throughout the year, and also subdivided the garden into geometric plots. Aesthetics, formality and functionality all combine to make the eighteenth- and nineteenth-century kitchen garden visually striking. and decorated terracotta fragments, roof slates and ornamental mouldings. Further domestic artefacts consisted of clay pipe stems, broken glassware, and pieces of iron. the external wall as part of its construction. Its other walls included part of the demolished bawn wall, as well as a new wall built between them. This small building only appears on the later OS maps, thus indicating that it dates to between c. 1840 and 1880. It forms an outside toilet, and two garderobes were exposed within its foundations. The garderobes were originally associated with a stone manhole, which was later replaced with one manufactured from red brick. Other walls which represented the remains of sheds or outbuildings were observed; they were located along the southern wall of the courtyard. Later renovations in the area of the kitchen garden included horse stalls which appear on the 1912 OS map; they are probably of late nineteenth-century date and used in association with the courtyard rather than the castle. A cobbled surface was identified in the southeast of the garden, between the wall and two of the paths, and represents the remains of the stalls. A line of seven postholes was also excavated which ran along the western extent of one of the pathways and forms the remains of a line of sheds that existed in this part of the garden in the early 20th century. played a crucial role in its reconstruction. The marl layer upon which the castle was originally constructed was revealed along with evidence for some of the early foundations. An association with the nearby abbey was demonstrated through the presence of the late sixteenth/early seventeenth ornamental wall tiles, early pottery, and some of the internal doors. of Cuddedy’s 1791 estate map. Some of the renovations undertaken in the 1820s were identified, notably within the castle annex and many of the surrounding gardens. rectified. Viewed in conjunction with the architecture of the castle, the excavations at Portumna Castle help contribute to the portrayal of the castle and grounds, as described by Burke, as probably the finest and most sophisticated house of this period in Ireland. Bence Jones, M. 1978 Burke’s Guide to Country Houses, Ireland, Volume I . London, Burke’s Peerage Ltd.
Craig, M.J. 1976 Portumna Castle . Dublin, Gifford & Craven. Leask, H.G. 1999 Irish Castles and Castellated Houses . Dundalk, Dandalgan Press.